Is it whispering secrets in Angela Brannon's inner ear? Evidence of the past and whiffs of her future? Is it Kokopelli, the trickster god, playing his flute? Or is it just a coyote howling? She listens for the messages. Inexplicable clues take Angela across time, across Texas. Her quest begins as a dreamâ€”or is it a vision? She is lured to the mammoth fossils buried beneath prehistoric mud slides, brilliantly painted churches concealed under whitewash, ageless Native American pictographs obscured by graffiti, and the elusive ghost lights of Marfa. Throughout Angela's unexpected mission, hints at each site propel her toward an unforeseen future. Searching her heart, her soul, to discover what is calling her, Angela must discern her calling. And then there's the call of love. Will she walk down the aisle with her fiancÃ© Kio, who is struggling along his own inner path, or should she risk their future to explore her attraction to Logan, the empathic art law student? Are the winds of change calling her in the right direction? Don't miss this climax of the Sacred Journey series by Karen Hulene Bartell! "Karen Hulene Bartell has written another winner in this finale to her 'Sacred Journey' series. It is an engaging story of romance and history, exploring the many facets of love as Angela lives with her extraordinary gift that allows the past to become a part of the present. 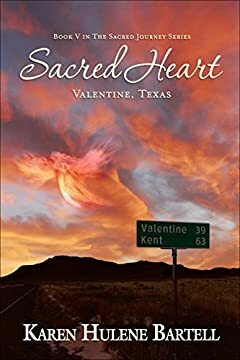 Sacred Heart: Valentine, Texas, is rich in the beliefs of the native peoples of Texas. The author has done extensive archeological research and mixes the paranormal with everyday experiences."